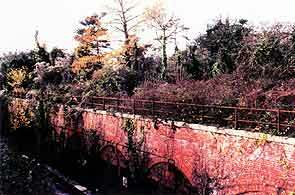 Fort Elson was constructed between 1858 and 1860 as one of the Gosport land attack defence systems. It is built on an irregular hexagonal plan form and is the most northern fort in this line. 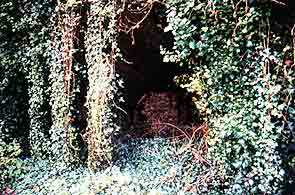 It is currently the oldest of the remaining forts as Gomer, situated to its extreme south has now been demolished. 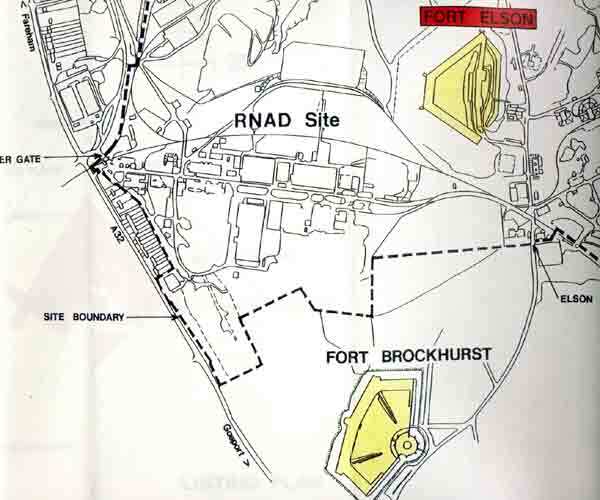 The ground between these two forts was later covered by Fort Brockhurst, Rowner and Grange which are of a more complete design. Fort Elson is not an advanced design as the later forts but was updated following Fergusson's report on the construction of Gomer in 1856 which detailed a scarp slip. 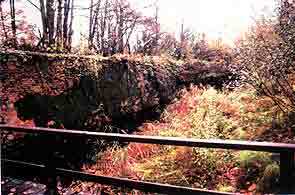 At Elson the scarp was constructed differently using internal brick arches resting against the scarp wall firing loops forming vaulting under the ramparts. 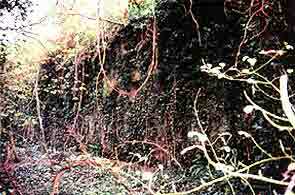 This method of construction is known as 'Escarp en descharge' and was adopted for the later forts. The fire power of Fort Elson was also uprated in 1860 following a further report when Haxo casemates were placed on the southern flank as this was seen as its most vulnerable area. Option 4 proposes controlled ruination that is to allow the fort to deteriorate under a controlled and planned manner ensuring adequate records and safety aspects are addressed. The precise strategy of Option 4.00 is dealt with later but below are the main reasons for prosing this option. 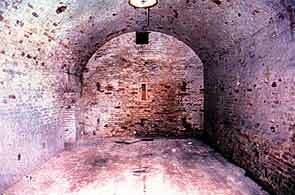 Fort Elson is situated within the heart of RNAD Gosport and within a restricted explosive area. RNAD Gosport has a long term future as a military establishment and therefore access by the public would be impracticable. 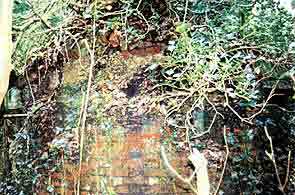 The present condition as described in detail in Section 3.00 can only be described as derelict in most parts with areas of heavy ground subsidence, extensive tree and vegetation growth and many areas of dangerous/collapsed brickwork. The plan of Fort Elson with its small rooms and restrictive internal access, means that the spaces within have little potential use for the MoD making reinstatement an expensive process with little yield in return. Any reinstatement, eg that detailed in Options 2.00 and 3.00, is inordinately expensive as the present condition is so poor. 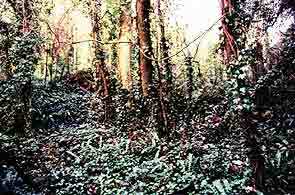 a) The vegetation is to be cut back from key features such as expense magazines, ramparts, Haxo casemates etc to allow full assessment of their present deteriorated condition and necessary recording to take place in safety. A detailed health and safety assessment is to be carried out highlighting those areas of potential danger to the recording team and MoD personnel. It would also recommend expedient methods necessary to eliminate these risks and ensure that it presents no further health and safety risks. 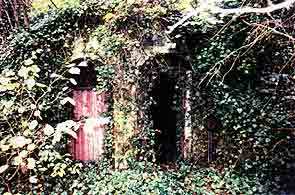 d) The above health and safety and structural survey would enable a planned programme of ruination to be set up. This would obviously need updating but would serve as a basis from which the MoD could work and plan. a) Detailed recording of key features such as Cavalier, Carnot wall, Moncrieff position and Entrance, etc, entailing measured drawings and photographs. b) More general recording of the fort assessing accuracy of existing drawings and detailing any variations, alterations and additions. Therefore preparing a record of the fort for archiving. The drawing work would only be supplemental with a full photographic record being taken. All recording levels and the extent would have to be established with English Heritage, Department of National Heritage and The Royal Commission on the Historical Monuments of England. "A Level 3 record is fully analytical, and will comprise an introductory written description followed by a systematic account of the building's origins, development and use. The record will include an account of the evidence on which the analysis has been based, allowing the validity of the record to be re‑examined. It will also include all visual records that may be required to illustrate the building's appearance and structure and to support an historical analysis. The information contained in the record will for the most part have been obtained through an examination of the building itself, without extensive use of other sources, and the record will not normally discuss at any length the building's broader stylistic or historical context and importance. 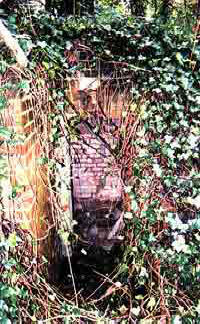 It may, however, form part of an extended survey of a number of buildings which will aim at an overall synthesis, such as a thematic or regional publication, when the use of additional source material may be necessary as well as a broader historical and architectural discussion of the buildings as a group. 1) As detailed in Section 2.00 Fort Elson is a Scheduled Monument and as such requires a degree of care which has been lacking in the past. For private landlords there is an obligation to reinstate but the MoD are still Crown exempt and strictly this does not apply. However, the MoD have standing orders which confirm its commitment to all current legislation. 2) Clearance/consultation for controlled ruination should be sought from the Department of National Heritage and without such it would be inadvisable to proceed. 3) It would also be strongly recommended that consultation with English Heritage, Hampshire and Gosport Councils and other interested parties such as the Palmerston Society be undertaken. 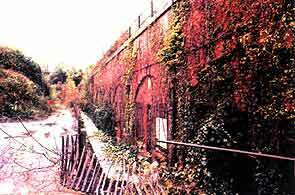 4) If the path of controlled ruination is followed then thought should be given to the potential use of reclaimed materials and artifacts which could be reused on other similar forts. 5) In addition to Fort Elson being listed, it also contains some key features only found on one other of the forts ‑ Gomer. 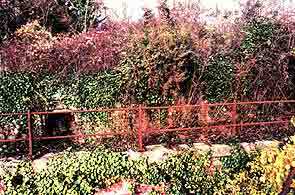 Gomer is now demolished and this therefore leaves Elson as the only remaining fort. 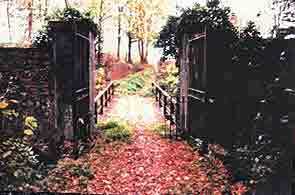 It is also the oldest of the remaining forts, a factor which needs careful consideration. a) Removes potential Health & Safety risks b) Most cost effective option considering Property Manager's limited budget. 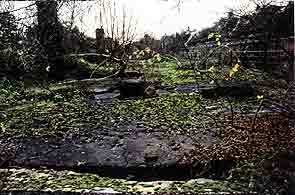 c) Controls present ruination and allows for recording and salvage of materials, as opposed to uncontrolled collapse. d) Appears most practical option considering present condition, reinstatement costs, little accommodation use if reinstated and no public access. e) Little long term financial commitment.